American & Schoen Machinery Company is a subsidiary of schoen + sandt Machinery GmbH, a world-renowned leader in Die Cutting Machinery and Systems for more than 140 years. The schoen + sandt Systems and Die Cutting Machinery offered by American apply to a wide range of cutting applications as well as an array of industries such as abrasives, apparel, automotive, cardboard, carpet, envelope and paper, floor tiling, foam, footwear, gasket, leather, medical, packaging, roofing, rubber, textile and more. 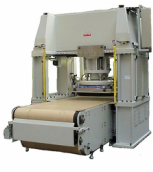 Cutting presses available are also wide-ranging, from standard swing beam presses to specialty designed large area or high pressure presses and everything in between. The unique Tru-Fit® Fiberglass Shank Material and Systems developed and manufactured by American & Schoen feature a reinforced fiberglass shoe shank that is ultra-light, non-conductive and an excellent insulator. The Tru-Fit® Shank provides exceptional memory for excellent shape retention as well as simplification of inventory control and forecasting.